Scroll down to view the images or click here to view the next page that highlights my arrival in Nebbi. Introduction to the images on this page: My first two days in southern Uganda (August 1-2, 2010) were characterized by miscellaneous misadventures. I somehow got locked inside a bathroom for 40 minutes and had to be rescued by someone kicking the door down. 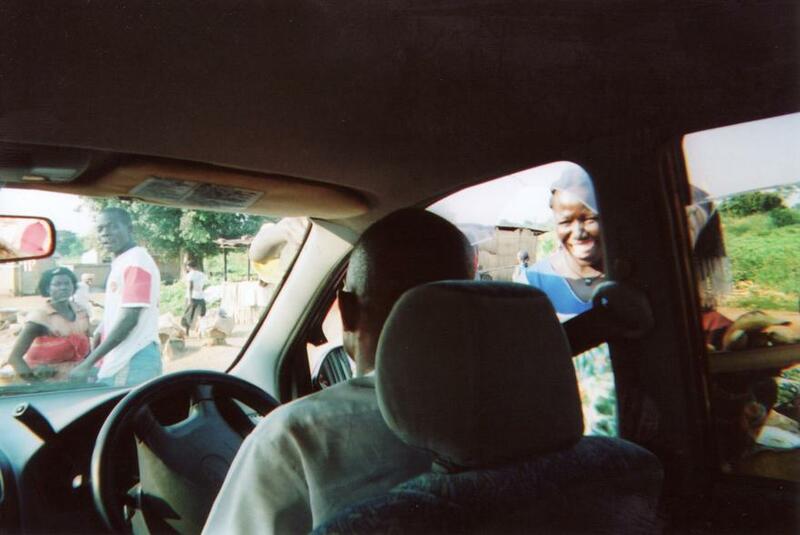 We had car trouble that delayed our travel to Nebbi (in northern Uganda) until Monday afternoon (August 2, 2010). I was initially unable to exchange my American dollars for Ugandan shillings. Betty's paycheck (she worked at a university in northern Uganda) didn't come in and she had no money. There was a time when we weren't sure how we were going to make it to Nebbi! In America, I always had some sense of control over my life, though perhaps this was an illusion. 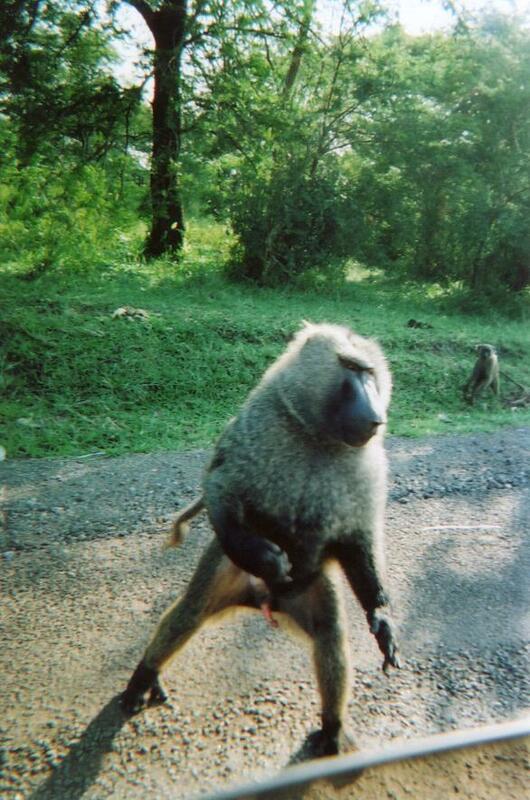 In Uganda, I quickly learned that I had no real control over anything. I realized that I was completely dependent on God to get me to Nebbi and back. I felt apprehension, and even a little fear at what I was walking into. 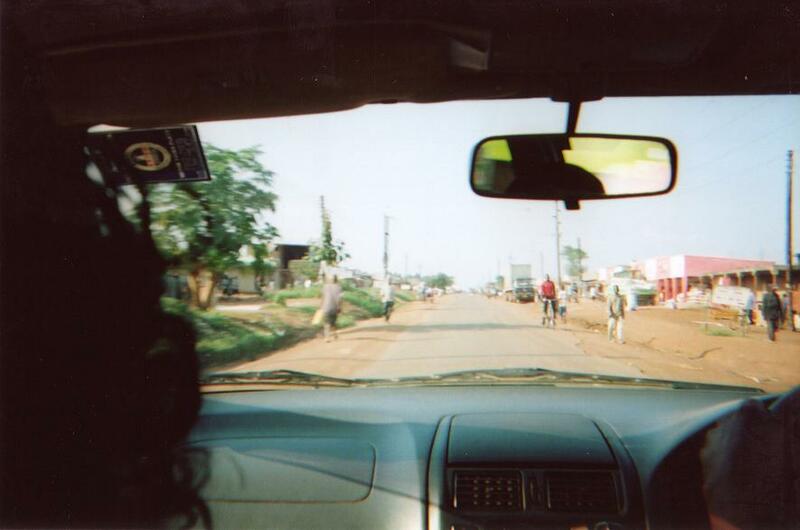 The images on this page highlight the sights along the way to Nebbi on Monday afternoon. The main road was paved, but there was a time not too long ago when it was a very bumpy dirt road. At that time, it took two days to travel to Nebbi. It took us only 4 to 5 hours. 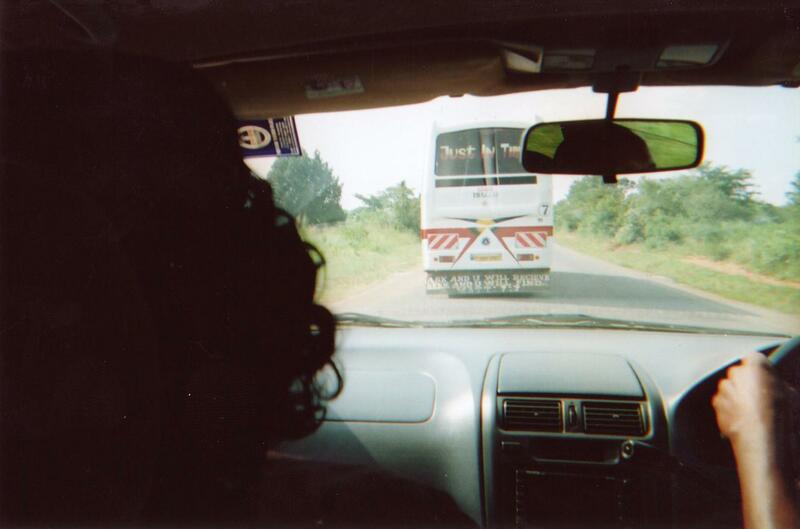 We saw this bus shortly after leaving Kampala. Above are the words: "Just in time." Below is a Bible verse: "ASK AND U WILL RECEIVE, SEEK AND U WILL FIND, MATT 7:7"
Betty and I saw this as an encouragement. We knew that God was with us! There were many towns along the way. When we stopped, we were swarmed by people trying to get us to buy from them! They rushed to the car and shoved corn, water bottles, and other items in the windows to get us to buy. It freaked me out the first time it happened! I didn't know how to respond to it! By the time I left Uganda, however, I got used to it and even welcomed it! This was the second time we stopped and were swarmed by people wanting us to buy from them. The girl in the window saw my camera, started dancing, and said, "Muzungu! Take my picture!" Muzungu is their word for a white person. There was a lot of wildlife along the road! I said, "Stand up!" And it did! 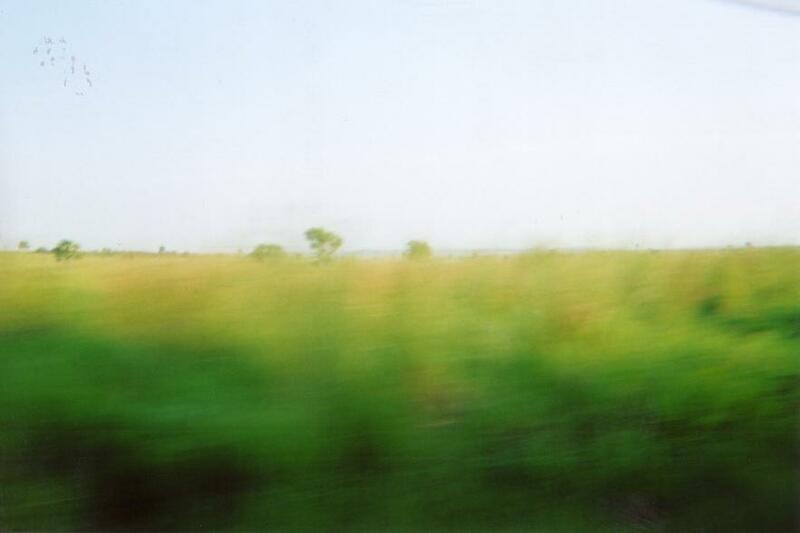 The scenery changed to grassland as we entered a drier climate in northern Uganda. This image also highlights how FAST my driver was going! I should add that he was a very skilled driver! 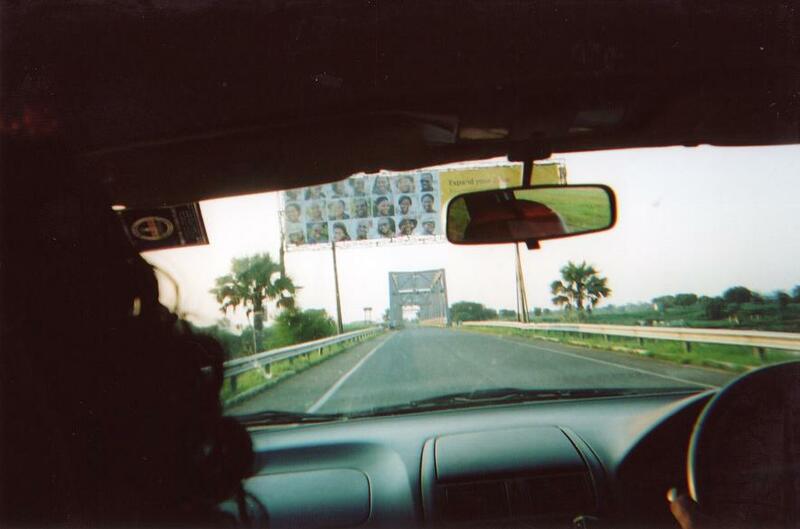 The bridge that we are approaching crosses the Nile River. This bridge is on the border of the region of Nebbi.